This is actually the second time I've watched and wrote up this film. I find myself far more forgiving and understanding of the movie, and I can tell that the first time I watched - I checked out after the first half. 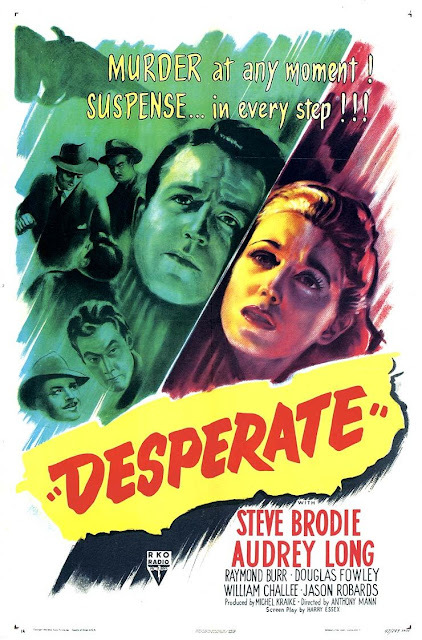 Desperate (1947) isn't a great movie. One could struggle to call it a good movie But it has certain good elements, from the casting of Raymond Burr in an early role that would lead to other noir-heavies to actor Jason Robard's father (also named Jason Robards) playing a very Robards-ian police detective. The movie does have stunning leaps of failed logic on the part of its leads and the loving wife representing home and hearth who seems not to have a thought of her own between her ears. Gangster Raymond Burr hires moving-man Steve Brodie and his truck to come do an overnight job at the last minute. Upon arrival, Steve sees Raymond Burr, whom he knows from their youth. Quickly he realizes this is a fur heist and tries to get away and then warn the cops - and it all goes wrong A cop is shot, and Burr's brother is killed. Furious at Steve Brodie- Burr decides to take revenge on he and his wife. Steve and his wife go on the run. I'm making this all sound logical - but somehow none of the motives make any sense. Burr wants Brody to take the rap for his brother shooting the cop, but Brodie has nothing to gain by playing along. He sends his wife *part* of the way to safety, and rather than telling her to go to a destination, he tells her to get on a train - and doesn't go to the cops. It's just stuff like this which make the first half puzzling as a viewer - but, hey, when you read actual crime stories, very little makes much more sense than this, I guess, so what do I know? The back half that I ignored on the last go-round is actually much better than the clumsy set-up - Steve trying to make right with the cops, trying to settle in, knowing Burr is out there, the other shoe about to drop. It's pretty good stuff. It's just a heck of a way to get there. The movie does get how to build tension and draw Brodie's character as "desperate" - and cornered, even when he's done the right thing. I may find a lot of how things work a bit preposterous, but I also like movies with giant roving Japanese monsters, who, who am I to say? The film has some ideal noir lighting and composition in certain scenes, and so hats off to DP George E. Diskant. Some brilliant stuff in here, providing real mood and menace. Brodie is fine - but you can see how he wound up as a supporting actor and went into TV. he doesn't quite have the presence of a Mitchum (who he knew from before Hollywood) or other contemporary leading-men. As solid as he is - it's hard to imagine him playing lead in many more films or wooing leading ladies. As a regular-joe newly wed truck driver? That I can buy. Anyway - non-essential viewing, but not *quite* as messy as I recalled from the first time I watched it.